I just got a message from a kid in Georgia. He and his family need a boat name, so I'm posting their message here. Maybe you can think of one and post your suggestions for boat names as comments below. we have had 2 other boats that werent quite big enough. 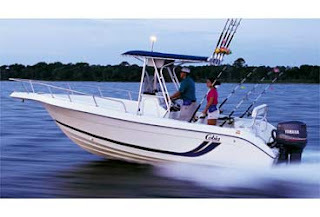 this one is a 20 foot cobia center console. its a boat for the family. -me mom and dad.- we like jimmy buffet. we only use it on vacation because wi live in GA and travel to Panama city beach. I love how kids today don't capitalize anything these days. I guess I'm old. I mean, it's not like I capitalize my key words when I'm searching for something in Google; I just feel emails should be written with a little more effort than an instant message. It's not like I'm asking you to lick a stamp or anything! Anyway, I can't stop thinking about how far these folks have to lug their boat everytime they want to fish. Last I heard all the lakes in Georgia had dried up, and who wants to boat in fresh water anyway?